Acid rainbow over Big Sur, October 2011. Photo by Lee Klinger. 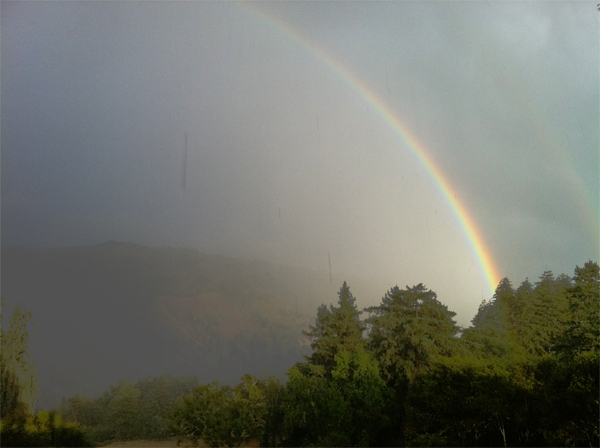 The rainy season has started early again this year in Big Sur, with the first rains falling on October 3. October rainfall at my rain gauge (see station photo below) totaled 3.53”. Below are the pH readings. Three of the four readings are notable higher (less acidic) than usual here in Big Sur, though all the readings are more acidic than what is considered normal for unpolluted rainfall pH (~ 5.6). This is not meant to imply, however, that the acidity measured here in Big Sur is due to anthropogenic pollution. There is a distinct possibility that a portion of the acidity is coming from natural, oceanic sources. Still, no one knows for sure where the acidity in the Big Sur rain is coming from. 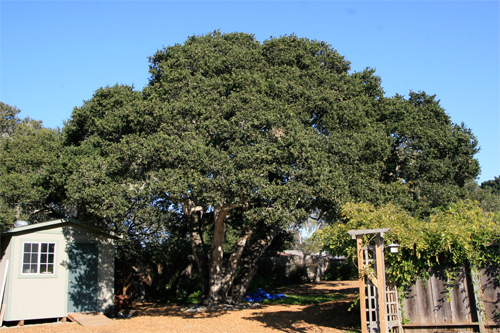 Six years ago I began fire mimicry treatments on these trees in Carmel . . .